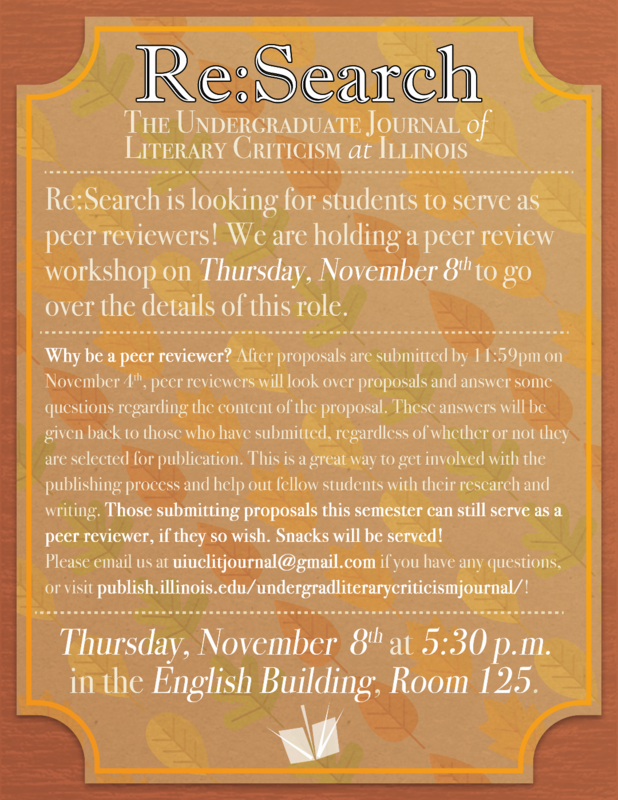 If you are interested in serving as a peer-reviewer, please email us at uiuclitjournal@gmail.com! Peer-reviewers get accredited in the journal, so if you’re looking for an awesome resume booster, this is for you! Peer Reviewing info session today! 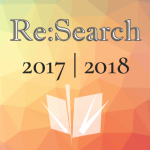 Reminder that peer reviewing info session is today at 5:30 pm in room 125 of the EB! Serving as a peer-reviewer is not only a great resume booster, but you get to contribute to the process of putting a journal together, and your name gets included in the acknowledgements page. We’ll have cookies too! Thank you to everyone who submitted proposals! We are now looking for volunteers to serve as peer reviewers, aiding in the selection process. 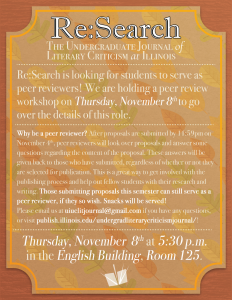 Peer Review workshop is this Thurs. at 5:30 p.m. in EB 125! You can serve as a peer reviewer even if you submitted a proposal! If you’re interested in publishing, peer reviewing is a great way to gain experience with one of the many essential steps of putting a journal together. Not only is it a great resume booster, but your name gets included in the Acknowledgments. Hello everyone! It’s been brought to our attention that the Call for proposals says the proposal should be double-spaced, but OJS checklist says it should be single-spaced, thus we will be accepting both formats without penalty. Our apologies for any inconvenience. We look forward to receiving your proposals! Hello all! This is just a reminder that proposals are due by tonight at 11:59 p.m. Let us know if you have any questions or run into any problems registering for OJS. We’re excited to have you share your work with us! One Day Left to Submit Your Proposal! If you’re planning to submit a proposal, keep in mind that the deadline is tomorrow by 11:59 pm! If you need a reminder of what to write for the proposal, click here for our official Call for Proposals 2017-18, where you can find all the information you need regarding the guidelines, deadline, and expectations. If you’d like to look at some model proposals, click here or here to find examples that were accepted in the past. If you’re ready to submit, click here for specific instructions on how to do so via the OJS system. Don’t forget! The proposal deadline is Friday, November 10th, by 11:59 pm. Your proposal must be submitted by that time.